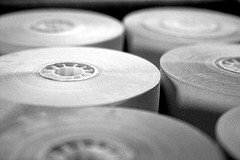 Last week Koehler Paper Company announced they would begin withdrawing the supply of their lightweight thermal paper in the US. This action is directly related to increased tariffs imposed by the US Department of Commerce stemming from an initial 2008 ailing. Koehler has outlined a phased withdrawal plan calling for reduced shipments to converters in February and March of 2013 with the potential for complete shutdown of shipments beginning in April of 2013. Currently Koehler estimates it supplies approximately 44% of the US market for lightweight thermal paper. Their decision to reduce shipments and potentially exit the US market altogether will no doubt create tremendous strain on lire supply chain for thermal paper and has already had an impact on the price of thermal paper. Rest assured, POS Supply Solutions is doing everything possible to ensure we continue to have a continuous source of supply. This includes on-going discussions with the remaining thermal paper converters & mills as well as looking at offshore alternatives. Our most immediate, and number one goal is to create an uninterrupted source of supply for our thermal paper needs. POS Supply Solutions will make every effort to keep you updated on developing news as it relates to the supply of lightweight thermal paper. POS Supply Solutions appreciates your business and values the relationship between our companies.